Musical rhythms and practice drills in 30 music styles in the classic 30 compressions to 2 breaths CPR cycle. 30:2 makes learning CPR fun and increases skill retention and confidence. The ACTAR 30:2 Audio CD helps students remember the proper sequence and pace of the New 30:2 CPR cycle.Practice drills lead learners through basic Rescue Breathing scenario including initial assessment and one-rescuer adult CPR.A great way to wrap up your CPR training sessions, recerts and CPR rallies. Use with ACTAR 911 and ACTAR D-fib manikins or any other CPR manikin. The Lifesaving Society Prompt Response CD features 14 rescue scenarios ideal for instructors teaching large groups. Play the audio tracks from a CD player to maximize hands-on practice time with candidates. Instructors can oversee candidates� progress quickly and confidently with each track. Includes stand-alone CPR drills and AED scenarios for drowning victims, shockable and non-shockable rhythms, and many more. Practice scenarios designed for students familiar with CPR and AED skills. Produced in accordance with the 2010 CPR and Emergency Cardiac Care Guidelines. Available in either English or French. 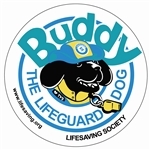 The Lifesaving Society Alberta Northwest Territories Branch is please to provide Buddy the Lifeguard Dog in support of your upcoming community event. Buddy is subject to availability and terms as per the "Buddy Booking Form" so please book early by calling the Society at 780 415 1755. Comes with 1 extra set of batteries, handbook, and checklist. This ten-minute video graphically illustrates the techniques that increase lifeguard alertness while reducing boredom and fatigue which, in turn, will help to save lives. It is the perfect addition to your National Lifeguard course or to your in-service training program.